Twice a month, we invite an educator to share their perspective on essential books for your classroom. To apply to become a contributor, please send us an email! As parents, teachers, librarians, family, and friends, we want to raise children who know how to be kind. Reading alleviates the dangers spurred by ignorance and encourages kindness and empathy. Children need to learn what makes us different to celebrate what makes us special. Let’s teach our primary and junior readers to take care of each other and to value and love themselves. Here's a list of books to help! 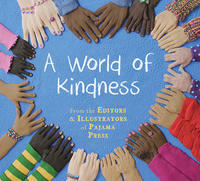 A World of Kindness, from the editors and illustrators of Pajama Press, is dedicated to Fred Rogers and Ernie Coombs, “whose long-running television shows gave us inspiring examples of gentleness and kindness.” So it is the best book to start with. For the smallest of readers, it asks one very simple question: Are you kind? Each page has another one-line question about kindness alongside a gorgeous illustration by many beloved illustrators. Some of the art is original to this book and some is taken from books already published by Pajama Press. 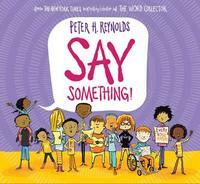 The end pages are filled with clearly written words such as “compassion,” “empathy,” and “consideration.” These words may be new for smaller readers but perfect to learn and great starting points for more conversation about how we can take care of each other. 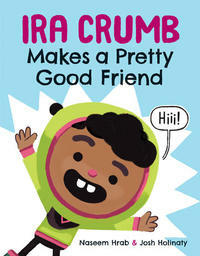 In Ira Crumb Makes a Pretty Good Friend, by Naseem Hrab and Josh Holinaty, primary readers are introduced to Ira, who is very excited. He is about to be the new kid at school and can’t wait to make a friend. He tries everything but nothing seems to work, not his dance-offs and not his cheesy sandwiches. He starts to wonder if he isn’t all a bit “too much, too soon.” This bright and bold picture book published by Owlkids reads like a beginner’s comic book that keeps you cheering for Ira until he finally finds the friend he was meant to have. 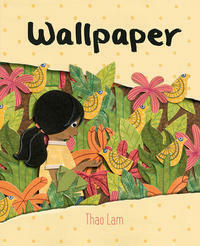 Wallpaper, by Thao Lam, takes a more gentle look at what it’s like to be the new kid at school. It celebrates the strength children will find on their own to do the hard things. After moving into a new house, our protagonist escapes the noise of the neighbourhood children and hides in her room. There is no text in this picture book, just gorgeous illustrations of the adventures the little girl must go through on her own before she’s ready to meet anyone new. She knows what she needs and allows herself this quiet time. When she finds a lifted corner of wallpaper she pulls it to reveal birds, a jungle and monsters. The drawing brilliantly shows us these adventures but also the struggles she is fighting against. After time, it is her imagination and bravery that give her the courage to leave her room and meet the neighbours. 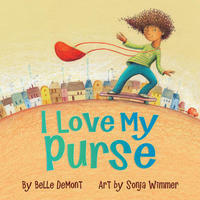 Speaking of kids knowing what they want, in I Love My Purse, written by Belle DeMont with art by Sonja Wimmer, we meet Charlie! Every morning Charlie wakes up and when he gets dressed, he doesn’t like any of his clothes. One day he decides to wear something he wants to wear, so he slings the purse his grandmother had given him over his shoulder. When his dad sees and asks “Why are you wearing a purse?” Charlie answers simply that he wants to. Charlie fills his purse with all sorts of interesting things, from a toy airplane to a tea cup. When the kids say that boys can’t wear purses, he doesn’t care at all! So what if other boys carry around backpacks and skate boards—Charlie’s purse makes him happy. When the kids and other adults around Charlie see how happy he is, they start thinking that maybe doing something different and just for them will make them happy too. Is there any book better to talk about kindness and loving others than a book written by Peter H. Reynolds? In Say Something! younger readers are empowered to stand up for each other and say what they’re thinking. Reynolds recognizes that for some this can be tricky, so he encourages children to use art along with or instead of their voice to express themselves—say it through a drawing or a poem! This book encourages children not only to listen, but also to be heard. In Ruth Ohi’s Fox and Squirrel Help Out, two of our favourite protagonists meet a surprise new friend—a tiny bat! Fox loves the bat from the start—the way it squeaks and how it cuddles warm on top of Fox’s head—but Squirrel isn’t as sure. Squirrel becomes frustrated with how much trouble Fox is taking to make the bat happy until Fox takes a nap. That leaves Squirrel to take care of their new friend, perhaps discovering some things about the bat they weren’t willing to learn before. 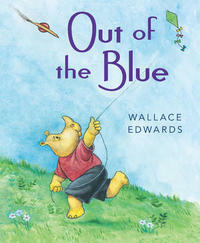 This book is for even the youngest readers and teaches the lesson that there is always room for a new friend. There can’t be a list of picture books about kindness without Franklin. 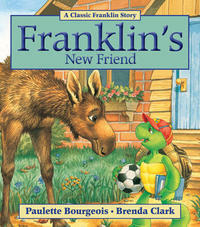 In Franklin’s New Friend by Paulette Bourgeois, illustrated by Brenda Clark, everyone’s favourite turtle does just that, makes a friend. But it isn’t easy. The problem is that Franklin doesn’t think he needs any more friends, he already has enough. So when his friends try so hard to include Moose, Franklin isn’t happy. Sometimes when you’re small, change can be hard. But when Mr. Owl talks to Franklin about how frightened Moose must feel as the new child at school, Franklin realizes he hasn’t been very kind. This book is a great story for primary and junior readers. It reminds us that making mistakes happens, and we then we learn from them and choose to be kind. 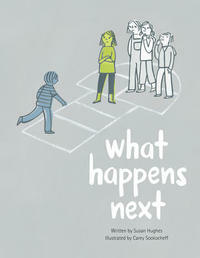 What Happens Next, by Susan Hughes and illustrated by Carey Sookocheff, offers the youngest of readers an early glimpse of what it means to have empathy. It is a simple story with clear and lovely pictures of a young child who is being bullied each day at school. At first no one helps; students stand by and either watch or laugh. The child doesn’t share what is happening with her parents and her worrying starts to take a toll. Eventually, the truth is shared with Mom, who tells her child how brave she is for sharing. The mother also talks to her child about trying to think of the bully and wonder how they may be seeing the world. The child decides to share her love of science with the bully, which does spark a common interest between the children. There are handbooks available for this book, for primary and junior aged children. 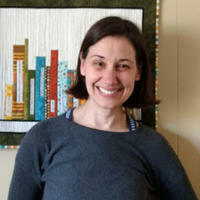 Sarah Campbell has worked as an elementary school teacher and a children’s programmer and library assistant. You would think working at a library would keep her from buying all the books, but it doesn’t. She lives in Waterloo, Ontario with her husband, their sons, and dog, Bingo. You can follow her at Pink Fish Reads.